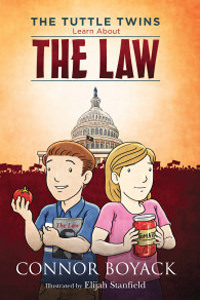 The Tuttle Twins Learn About the Law is 62 pages long and full of fun, colorful illustrations. Recommended reading age: 6-10. People have approached the Mises Institute about publishing a book on economics for kids. But why reinvent the wheel? Grab your copy of the second book in the Tuttle Twins series—and help the children in your life learn how the free market works! What kind of creature can steal your money? Join Ethan and Emily Tuttle in their exciting third adventure! The oldest economic battle is repeating itself! Nobel prize winning economist F.A. Hayek’s famous book, The Road to Serfdom comes to life in this edition of the Tuttle Twins Series. A summer camp adventure like no other!